BOSTON (AP) The Bruins say leading goal scorer Patrice Bergeron is out with a fractured right foot. General manager Don Sweeney announced on Tuesday that a CT scan revealed the injury. Bergeron will be evaluated in two weeks. The forward originally suffered the injury while blocking a shot during the team’s 4-3 loss at Toronto on Saturday. He was evaluated after that game, but an X-ray was negative. 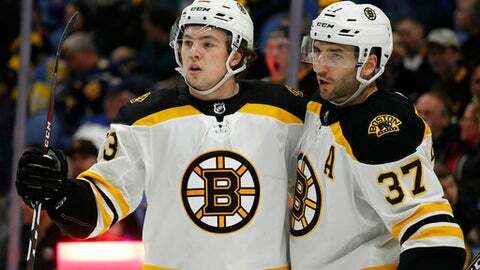 Bergeron played in the Bruins’ 4-1 loss at Buffalo on Sunday despite arriving at the arena wearing a protective boot. Bergeron has appeared in 55 games this season and has 27 goals. He also has 27 assists. The Bruins are third in the Atlantic Division. They host Carolina on Tuesday night.